The couple have spent three months trekking through China, Vietnam and Cambodia. It was a lonely trip. Liu Linna, better known by her nickname Liu Shasha, and her husband Yeung Hung have spent three months trekking through China, Vietnam and Cambodia in search of political asylum amid a Chinese government crackdown on the Umbrella Movement. Looking tired and worried about an uncertain future, Liu spoke about her fears of jail and experiences of torture shortly after being urged to leave Cambodia, which does not have a spotless history when it comes to dealing with asylum seekers. Speaking with halting English, Liu said her friends and pro-democracy activists in China – Wang Zang, Sung Ze and Xie Wen Fei – had been jailed on the mainland in the aftermath of the Chinese pro-democracy protests, based out of Hong Kong late last year. “They are very brave, young men. They are all in jail,” she said, with the help of a smartphone translator. “Some people face life in prison simply because they support the Umbrella Movement, including Su Changlan. She is brave. It’s very sad.” Liu added that she had experienced waterboarding while in Chinese mainland detention. Liu is a prominent political activist who was banned from traveling by the Chinese police, preventing her from taking part in the Hong Kong protests that erupted after the Chinese government reneged on a previous promise to grant the territory universal suffrage. She defied the authorities and escaped to be with her husband, a fisherman from Hong Kong who also supported the student-led protests, which shut down the main roads and thoroughfares of the former British colony’s business district. Their plight has been closely followed through social media websites. In Vietnam, she said the authorities were initially angered by her crossing the border without an exit stamp but soon calmed down and allowed them to stay. But the couple realized they could not stay there forever and so made the overland trip to Cambodia, where they hoped for asylum and resettlement in a third country, preferably the United States. She said that the Vietnamese authorities took them to a border town, and pointed towards Cambodia. However, the United Nations and Western embassies in Phnom Penh were ineffectual in helping the couple. Cambodia is a signatory to conventions on refugees, but the government has applied its rules haphazardly and previously returned asylum seekers fleeing China. “I don’t want to become a refugee in Cambodia. I want to go to Thailand and must cross Cambodia,” Liu said, adding asylum seekers on Pacific island-state of Nauru should resist Australian attempts to resettle them here. “I am in this country and I can tell you it’s not friendly. It’s not kind,” she added. 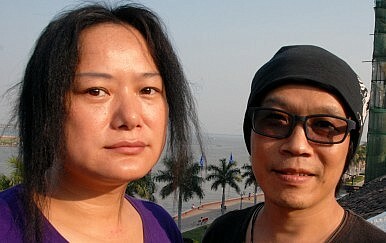 Liu and Yeung met after he trekked into the mainland. He once captained a Hong Kong fishing vessel that ferried Chinese nationalists to the disputed Diaoyu islands. They were arrested and deported by Japan in October 2012. Initially, the couple had been crossing borders on a home travel permit that allows Hong Kong citizens to visit mainland China. However, Yeung’s permit was subsequently revoked after he and Liu tried to visit the wife of jailed Nobel peace laureate Liu Xiaobo, currently under house arrest in Beijing. The award outraged Beijing. It says Liu has broken Chinese law and has held him since 2008 after he helped write Charter 08, calling for sweeping changes in China’s government. The petition was signed by thousands of supporters but earned Liu an 11-year prison sentence for inciting subversion of state power. His wife Liu Xia has been held under house arrest at their Beijing home since Liu won the Nobel Peace Prize. Yeung was detained by police in the border city of Shenzhen in late 2013, after he tried to cross from Hong Kong to meet his wife. He was then jailed for eight months on charges of illegally crossing a border. Liu Shasha’s most strident criticisms, however, were reserved for China and its paramount leader Xi Jinping, who has maintained a government crackdown on corruption. Analysts say the crackdown has been used to shut down dissent and purge Xi’s potential political enemies. “He is very cold. It’s like the Cold War all over again,” Liu said, as she packed her bags for her next destination. Chinese Nobel Laureate Liu died of multiple organ failure after years in jail. His widow remains under house arrest.